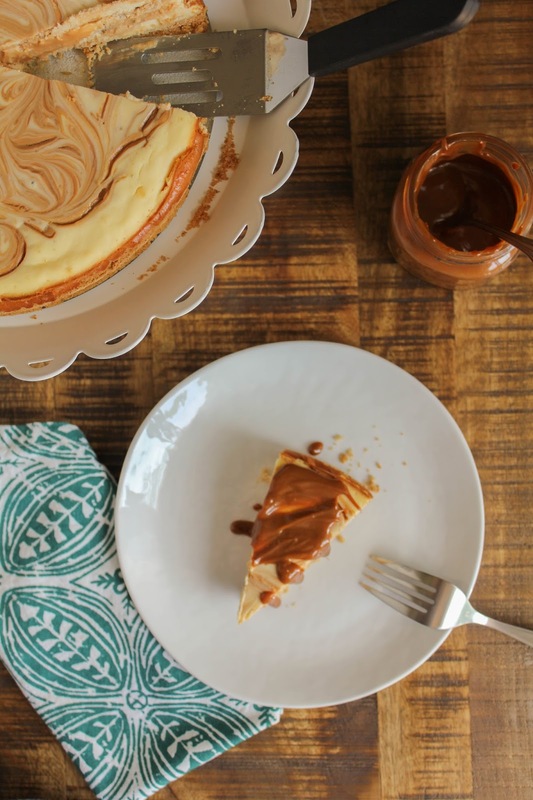 Rich and creamy Dulce de Leche Cheesecake with a #SweetSwap of SPLENDA® instead of sugar! Summer is here (and it will officially be here this weekend!) and with that comes more summer events and BBQ's and, of course, more delicious dishes that we love. I don't know about you, but for me summer means making smarter choices, too. Whether it's getting outside and exercising more, or being more conscious of the foods we are eating. 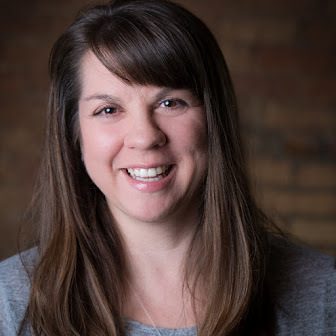 To help inspire and motivate us to make smart choices, the SPLENDA® Brand is sharing ways to reduce added sugar by swapping out full sugar for SPLENDA® Sweetener Products. Using products like SPLENDA® No Calorie Sweetener, Granulated, SPLENDA® Sugar Blend, and SPLENDA® Brown Sugar Blend, we can create the dishes that we love without the added calories! SPLENDA® has an amazing website called SWEET SWAPS™, that includes tons of simple recipes for breakfast, dinner, dessert, snacks, even holidays! They even have tips and tricks to help you get that balanced lifestyle. Did you know that swapping just one cup of sugar with one cup of SPLENDA® No Calorie Sweetener, Granulated can save more than 600 calories? That's amazing! So a couple of weeks ago I got together with a few of the ladies in my neighborhood and we went for a power walk early one afternoon. When we were done, we came back to my house for a little treat. 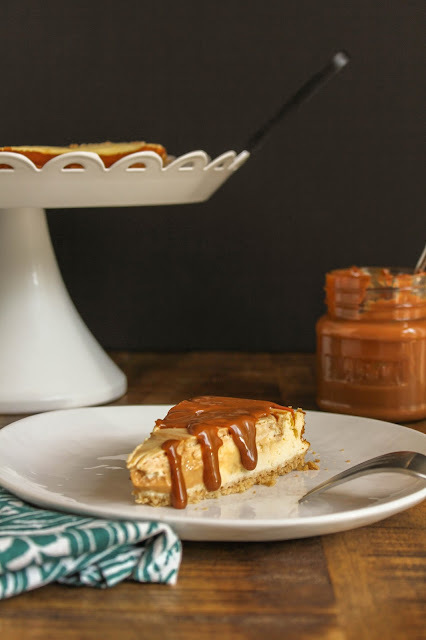 Little did they know that I had this glorious Dulce de Leche Cheesecake waiting for them! Made with reduced fat cream cheese and SPLENDA® No Calorie Sweetener, Granulated, one piece has just 210 calories! Needless to say, they asked if we could go for a walk every weekend and come back to my house for dessert! How can I say no? Mix the crust ingredients together and press into a 9-inch springform pan. Place the pan on a baking sheet and bake for 10 minutes. Remove from the oven and cool to room temperature. Lower the oven temperature to 325 degrees. In the bowl of a stand mixer, beat the cream cheese, SPLENDA® No Calorie Sweetener, Granulated, and flour together until well mixed and smooth. Add the vanilla and mix until smooth. Add eggs one at a time, beating well after each addition, and mix until smooth. Add the milk and mix until well blended. Measure a half cup of the cheesecake batter and pour into a small bowl. Add the dulce de leche and stir until well combined. Pour the plain batter over crust. 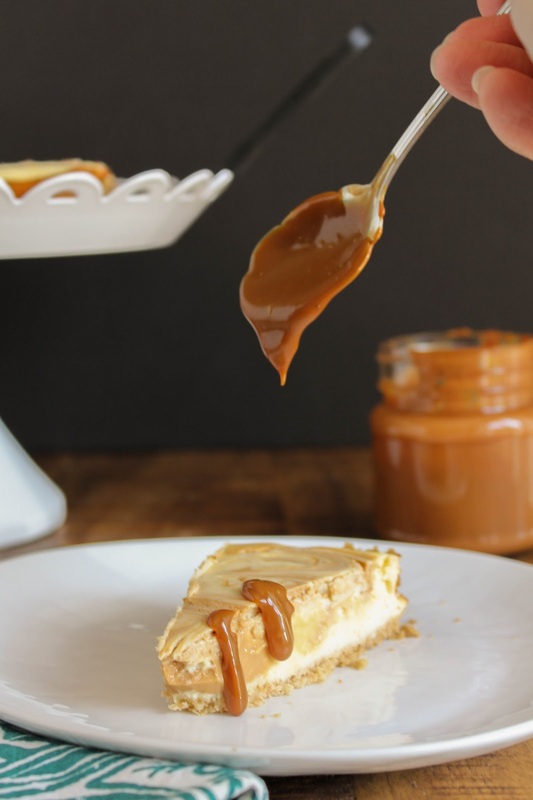 Top with the dulce de leche by placing rounded spoonfuls over the cheesecake batter and gently swirling into the plain batter with the tip of a knife or a spatula. Bake 45-55 minutes or until the center is almost set. 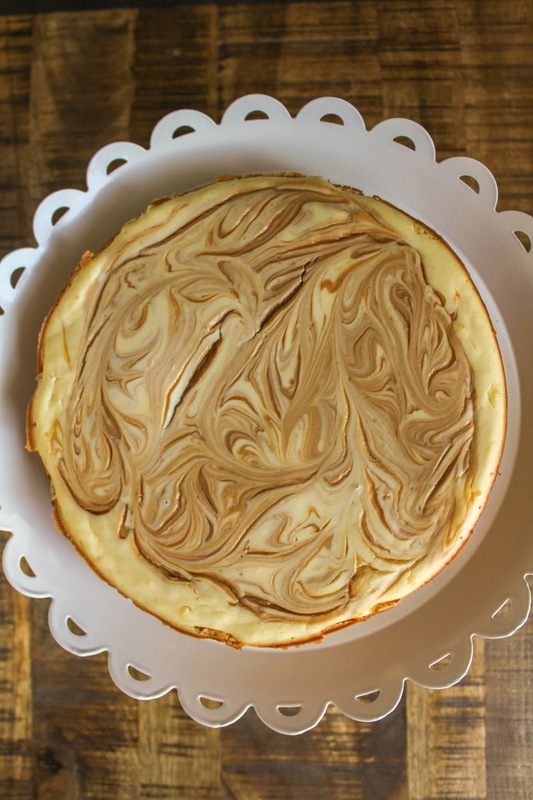 Remove from the oven and gently run a metal spatula or knife around the rim of the pan to loosen the cheesecake (this helps prevent cracking). Let cool 20-25 minutes before covering and placing in the refrigerator. Refrigerate for at least 4 hours or overnight before serving. 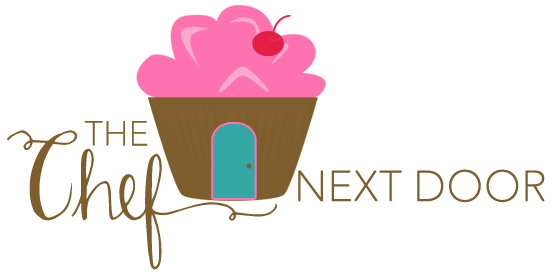 Be sure to visit the SWEET SWAPS™ Website for more delicious recipes! Also follow SPLENDA® on Facebook, Twitter, and Pinterest.